This volume contains the proceedings of the first-ever Noth American ALMA Science Center (NAASC) Workshop, which took place in January 2006 at the National Radio Astronomy Observatory's headquarters in Charlottesville, Virginia. The focus of the meeting was an important new category of instrument, the "z-machine" -- an ultrawide-bandwidth spectrometer optimized for the study of distant, dusty galaxies. 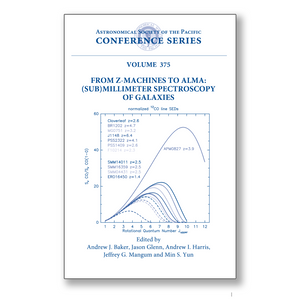 In addition to detailed descriptions of four z-machines currently under development by different groups, and of the exciting spectroscopic capabilities ALMA will soon offer, this volume includes diverse perspectives on galaxy populations to be studied, spectral features to be targeted, methods to be used for data analysis, and connections to be forged with observational programs and technical efforts at other facilities and/or wavelengths. The 23 oral and 31 poster presentations represented here, along with audience discussion, come from a mixture of theorists, observers, and instrument-builders. The book will thus be a comprehensive and valuable reference for researchers and graduate students interested in the scientific promise and /or technical challenges of ultrawide-bandwidth spectroscopy -- an increasingly important enterprise as ALMA moves closer to full operation.